« Day 247 in Beijing: Skating on Houhai Lake. Day 248 in Beijing: Cars and Motorcycles. Mercedes Benz SLS AMG. Yours for the low asking price of $275,000 USD. I’ve posted a few times about the cute little cars in Beijing. Well, there is a huge disparity in regards to money here that shows up, very quickly, when I venture down to the more upscale parts of Beijing. I’ve seen more Lamborghini, Maserati, and top of the line Mercedes Benz here then I have anywhere else I’ve lived. Porsche, in Beijing, are not even worth noting because there are so many of them. I have lived in San Francisco and some other very wealthy cities and nothing compares to Beijing. I have heard the Hong Kong actually puts Beijing to shame but I have yet to visit there. The disparity between the haves and the have-nots is amazing. There are many people working in Beijing and trying to live on about $300 USD a month. The cleaning lady that works for us and the security guards around our apartment complex are probably paid about that much. 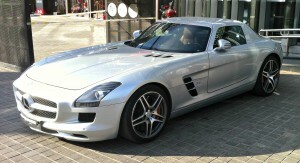 I was walking around a few days ago and passed by this Mercedes parked on the sidewalk. Two days later I saw the exact same model but in red. The base price for this model is $275,000 USD. I would guess that no one buys the “base model” and this is probably selling for closer to $350,000 USD. It has “gull wing” doors which look amazing when they are opened as they swing up above the car instead of out to the side. And it is just parked on the sidewalk in broad day light. I then noticed the motorcycles near the Mercedes in a mall show room. I think I’d like to try and ride one of those bad boys.